Web browser firm Opera has today launched Opera TV Store, a service that manufacturers can add to TVs, set-top boxes and Blu-ray players, making it easy for users to find HTML5 apps to run on the big screen in their living rooms. Optimized for ‘HD-Ready’ (720p) screens and standard remote controls, with an interface designed to be a ‘lean-back’ experience, the app store features recognisable names like Vimeo, Facebook and TuneIn Radio. It was first announced as a preview in September last year but receives an official launch today at CES in Las Vegas. While it’s likely that many of the ‘apps’ on the store will simply be reformatted websites, that’s not necessarily a bad thing. Norway-based Opera is courting developers to build new content for the store via a dedicated portal. Advertising can be integrated into apps via Opera’s Open Mobile Ad Exchange. Apps on TVs are nothing new. Some manufacturers have featured YouTube modules, Yahoo widgets and more on Internet-connected models for some time. However, 2012 is likely to be the year when your TV really starts to become a canvas for developers’ imaginations. Google TV has opened up to developers and it seems likely that Apple will similarly open up its iOS-based Apple TV box to third parties. 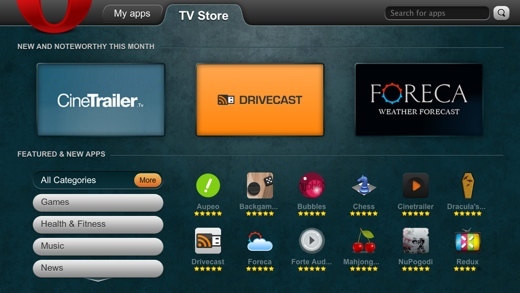 Meanwhile, Samsung’s TV apps passed 10 million downloads in October 2011. There’s no word when Opera’s TV Store will start shipping to consumers, but manufacturers can begin installing it right away. The Next Web is reporting from CES this week. Keep up with our ongoing coverage here.